red&apos;s are defenders, blues interpass with agivennumber of touches playing through defenders when possible, e.g. 1 touch to play back. two trecieve, turn or big touch, little touch etc. touches represent defenders progression. 1. 4v4 up and down maintaining support re-angle a distance in relevant 1/3s of the field e.g. 1 player behind ball. 1 inside, 1 in-front, constant in all areas of the field. Progression. 2. 4v4 game applying all of the above principles. Full game on grids applying all of the above principles. 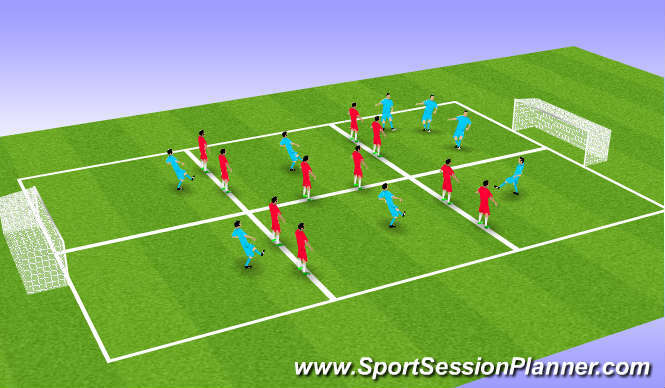 Different kinds of passing, what touch, re 1/3s of the field. Space, time and movement. What part of the field. Rotation, When? where? Support how close 1/3s angle and distance. High intensity. Sharp. Short Running, agility, balance, strength. Success brings confidence, small improvements lift the playerespecially undestanding. Players were very good. Tired after 25 mins, showing how hard they need to work in the game re support, movement thought.